Several dozen members of the Society were in Paris on 6 and 7 December 2016 to see Rosalind Savill, our President, and Tamara Préaud, invested with the order des arts et lettres for their lifetime research on Sèvres porcelain. Many of those who came to see the fun (including three former chairs of the Society – Dame Rosalind, Aileen Dawson and Errol Manners) were veterans of similar study trips, but we were delighted to be joined by Mia Jackson, who has now taken up a curatorial post at Waddesdon Manor and by Rebecca Wallis, curator, ceramics and glass, at the Victoria and Albert Museum, both assisted by bursaries from our Mavis Watney fund. 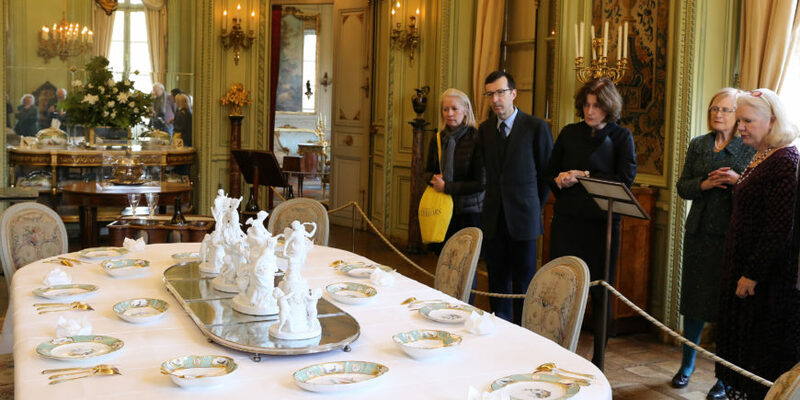 Before attending the investiture and a lecture at the manufacture de Sèvres on the evening of Tuesday, 6 December, we visited the exhibition ‘Les Services aux oiseaux Buffon du comte Moïse de Camondo’ at the musée Nissim de Camondo. During the afternoon we were at the musée de Sèvres for a handling session which brought many of their greatest treasures out of their showcases. The final item in our programme on Wednesday morning was a visit to the musée des Arts Decoratifs in the rue de Rivoli to see the recently completed new collection displays of eighteenth- and nineteenth-century French art and design. This was followed by an excellent lunch in the Paris offices of Bonhams a short walk away, with the opportunity to see some key pieces from a forthcoming London sale. Some of the group also made their way to St Cloud that afternoon where we saw a small but significant exhibition on St Cloud porcelain in the musée des Avelines. The trip was organised by Patricia Ferguson, and John Whitehead as ever opened museum doors and arranged for us to meet the subject specialists. Very many thanks to both.